Perhaps you first read about it in your Amsterdam Guide Book or were tipped off by an in-the-know local friend. Then you sampled the goods and instantly understood what all the hype's about. Now you can recreate Amsterdam's most coveted carrot cake in your own kitchen. The moist cake is made all the more luscious with a generous amount of coconut and pineapple. 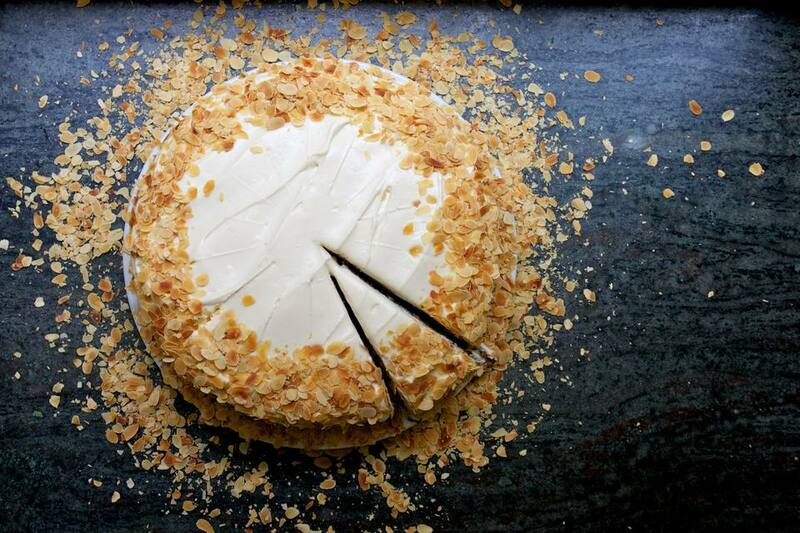 It's topped with cream-cheese frosting and doused with roasted almonds. Deliciously addictive. Preheat the oven to 350 degrees F (175 degrees C). Beat together the sugar and vegetable oil until light and fluffy. Add the eggs and vanilla extract, and beat well. Sift together the flour, baking soda, salt, cinnamon, nutmeg and allspice, and fold into the wet mixture. Then fold in the grated carrot, flaked coconut and crushed pineapple. Folding is important here, to keep the cake light and fluffy.Over-mixing will make it rubbery. Grease the spring-form pan. Line the bottom and sides of the pan with baking paper. Pour the batter into the pan, and bake for 1 hour. Remove the cake from the oven, and insert a toothpick into the center to check if done. If the toothpick comes out clean, the cake is ready. Let the cake cool for at least 2 hours before removing from the pan. Cut the cake horizontally in half with a thin, serrated knife. Open the cake so the cut sides are face-up. Meanwhile, prepare the frosting. In a mixing bowl, blend the cream cheese, cream, vanilla extract and powdered sugar. Place a generous dollop in the center of one side of the cake and, with a spatula, spread it in a 1/3-inch (1 cm) thick layer outwards, stopping about 1/3-inch (1 cm) from the edge. Place the second side of the cake, cut side down, on top, and gently press down until the frosting spreads to the edges. Cover the top and sides of the cake with the remaining frosting. Sprinkle the sides and some of the top of the cake with the toasted almonds, leaving a nice white center. Note: Make the cake the day before. It's easier to spread the frosting when it's completely cold.